This week we have the 5th grade band concert and the holiday fair at school, so I'm forced to get creative with the menu this week due to time constraints. Since the weather will be mild early in the week, we're going to take advantage of the use of the grill on Monday. The recipe highlight from last week was the hamburger soup. It was a huge hit! The kids loved it, which was a big surprise because Harper is so picky about soups. Try it. I think it'd be an easy one to make in the slow cooker too. Tuesday - Dinner out!!! It's my birthday which means my choice of a restaurant. Wednesday - Emma's band concert starts at 7, and she needs to be at the school by 6:30. I'll pick up a quart or 2 of soup from our local Italian market, Joe Leone's, some fresh rolls, and I'll make a side salad. Thursday - Baked chicken cutlets with mashed red potatoes and roasted asparagus. Friday - It'll have to be dinner on the run. I have to be at the girls' school at 4 to set up the shop for the school holiday fair. We'll be leaving the fair for a 6:15 so that Emma can perform with the 5th grade chorus at the town's tree lighting. We'll return to the school afterwards to finish working at the fair. It'll be a busy night with no time to cook. Saturday - Linguini with the hubs' homemade marinara sauce, arugula salad. Sunday - Hubs is on dinner duty! Make meal planning easy! 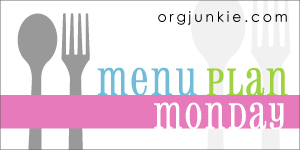 Visit I'm an Organizing Junkie for tips, ideas, and resources for planning your meals. To view my full list of meal plans, click POM Menu Plans.